Small business failure rates increased by 40% from 2007 to 2010. NEW YORK (CNNMoney) -- When it comes to small business success, California is the not-so-Golden state -- at least that's what a recent report from Dun & Bradstreet suggests. California's small business failure rate was 69% higher than the national average, the worst of all the states, the report said. Nevada is next, with a rate 65% higher than the national average, followed by New Hampshire with 38%, Tennessee with 36% and Colorado with 33%. Nevada and California made the list because of real estate markets hard hit by the recession, said Byron Vielehr, president of global risk and analytics at Dun & Bradstreet. The housing market collapse hit small business hard, he said. 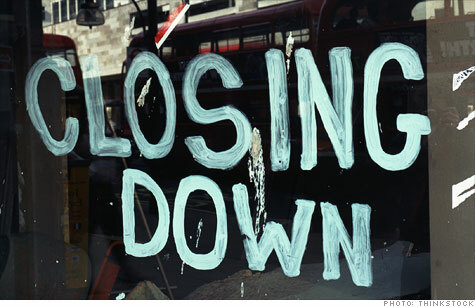 The recession is at the root of most of these high small business failure rates, Vielehr said. The downturn hurt Colorado's tourism businesses and hit Tennessee's manufacturing industry badly, Vielehr said. In fact, Tennessee has been among the five states with the worst failure rates since 2007, according to the report. Across the United States, small business failure rates rose by 40% between 2007 and 2010, according to the report. On the other side of the coin, North Dakota, Vermont, Iowa, Wyoming, and Kansas have the lowest rate of small business failures. North Dakota had a 67% lower failure rate than the national average, followed by Vermont with 47%, Wyoming and Iowa (40%) and Kansas (39%). North Dakota, Wyoming and Iowa have all been in the top five for the past four years. These rural states did not have the economic boom that other areas of the country had, so the fall during the recession was not so stark, said Alla Kramskaia, senior director of statistical consulting at Dun & Bradstreet Global Analytics. North Dakota and Wyoming's economies were also supported by their rich energy resources, said Kramskaia. The small business sector seems to be recovering, said William Dunkelberg, chief economist at the National Federation of Independent Business. ''We are seeing firms not firing workers like they were,'' he said. Dun & Bradstreet (DNB) looked at 23 million U.S. small businesses in its databases, and used bankruptcy statistics and other information to determine business failures.